The Golden Avenger four wheel heavy duty scooter provides an impressive blend of rugged outdoor maneuverability while giving a smooth comfortable ride over a variety of nature’s most challenging terrains. 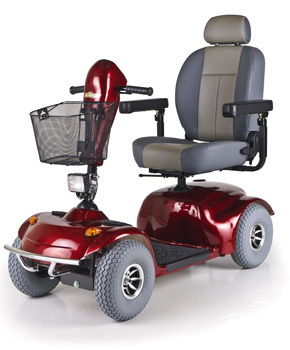 Durable and stylish, the Avenger includes a standard front basket, a full lighting package and an extra roomy seat with an adjustable headrest. If power is what you need, look no further than the Avenger. Featuring a 500 lb. weight capacity, the Avenger uses two NF-22 batteries that provide a range of up to 18 miles between charges.